SECURE: The camps were very productive, many golden dorado as well as big pacu, a good number of yatorana, a beautiful 19-pound surubí (catfish), two massive dorado (26 and 30 pounds) caught on tiny Chernobyl ants on the same run. AGUA NEGRA: The water level on the main river was higher than normal, due to a flood at the end of the previous week, but we still had some really good days of fishing. 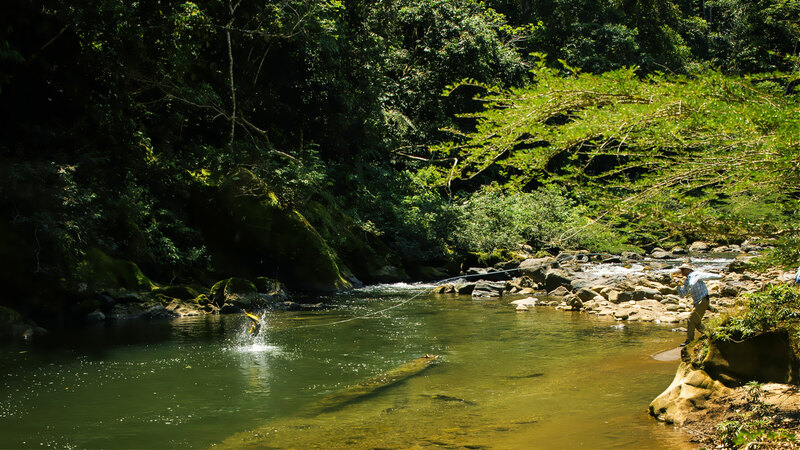 It rained in the middle of the week, but we still had good fishing in the small tributaries and on the Agua Negra. As always, the fishing on the Agua Negra was very technical, but it was loaded with fish and many feeding frenzies. We spent two nights camping on the upper part of the river, and the fishing was very good. Everyone had the chance to get some huge fish in both rivers, and we landed many medium-sized fish as well as some giants. The biggest fish of the week – a beautiful 25-pound dorado -caught on the Upper Agua Negra. PLUMA: The weather was tough, as it changed the entire week, and rains in the headwaters complicated everything. But we used every good weather or clear water window we had and landed 12 fish over 25 pounds during the week. In the muddy water of the upper sections, big flies with rattles got the job done, and it was the same on the lower sections. Using the same flies but with intermediate lines on the lower sections, we had the unusual luck of landing four surubi (striped catfish) during the week.